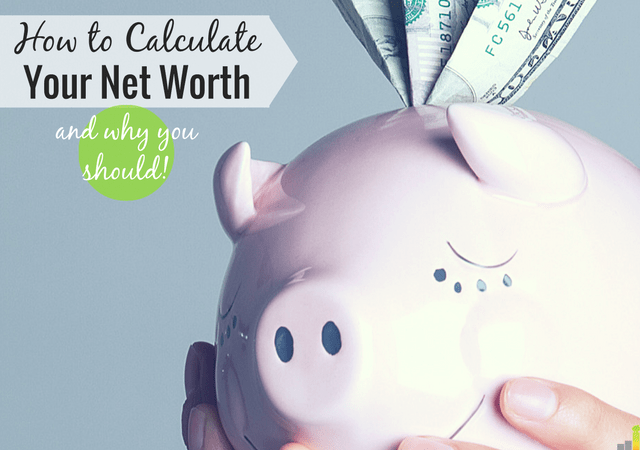 There are many misconceptions about how to calculate your net worth. Some people believe your net worth is how much you make in a year. Some add in assets they probably shouldn’t. For some, reaching a certain net worth is a hallmark of financial independence; for others, a net worth number is the driving force or motivation for every decision they make. With this financial term meaning so much to some while remaining shrouded in mystery for others, I thought today would be a good time to do a comprehensive post about net worth – what it is; how it’s calculated; and why it’s important. So, let’s get started. Your assets include your home; cars; the balance in your brokerage accounts; the balance in your 401(k); vacation properties; and your cash on hand. Other things could be included as assets too. For example, some people might include their jewelry or the art in their house. I personally don’t count those things as assets because their value could really vary and they aren’t as easy to liquidate as a vehicle. Once you know your assets and how much you have, then calculate your liabilities – also known as debt. Your liabilities would include your mortgage; student loan debt; personal debt; or any other debt you might have. Subtract your debt from your assets and you’ll get your net worth. For some of you, you’ll have a negative net worth like I do because of six-figure debt. However, the point is to pay down debt as quickly as possible so you can reach a net worth of 0 and increase it from there. You might be wondering why you should know your net worth or why it matters. The reason it’s important is because net worth is a good measure of financial stability. We live in a world where 1 in 3 Americans have saved $0 for retirement. That’s not a good indicator of someone who is financially well off. You don’t need to know your net worth to pat yourself on the back when you become a millionaire. Rather, you need to know it so that you have a strong understanding of your own personal finances. Most people might not even realize how much debt they have until they actually sit down and add it up. It’s something that everyone should do as a way to motivate themselves to achieve more when it comes to their finances. Net worth is not something that you have to share with everyone. It’s something just for you to know so you can track your progress and get excited when you reach your goals. 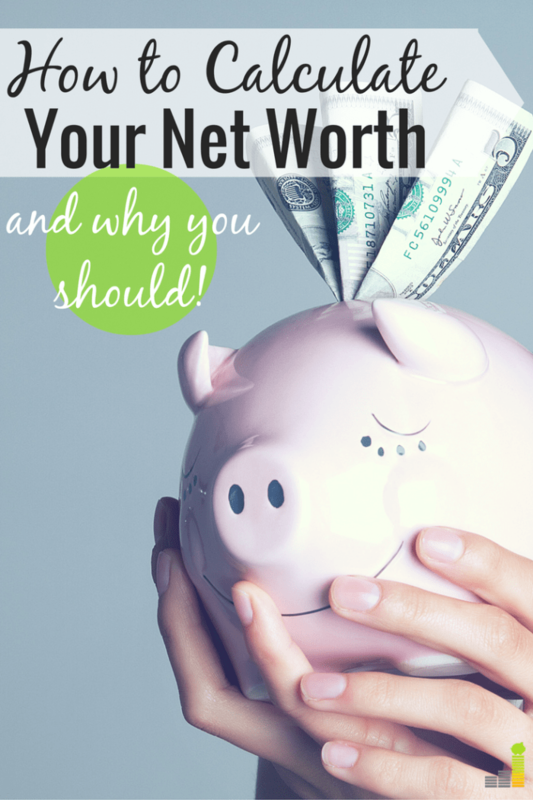 Having a solid net worth can help you in many ways. For one, if you achieve a high net worth you can retire early or leave your job whenever you simply get tired of it. Knowledge is power, and when you know where you stand, you can make better informed decisions about what type of home to buy, whether or not to get a new car and more. In sum, having an intimate knowledge of your personal finances and tracking your investments makes you more aware of every money decision you make. If you’ve calculated your net worth after reading the above and aren’t happy with what you see, don’t worry. It’s never too late to start improving your finances and increasing your overall level of wealth. There are two tools in particular that are perfect for helping you on this journey. The first tool is Personal Capital. Personal Capital is a completely free way to track your net worth. I love it because you can see all of your assets on one screen. 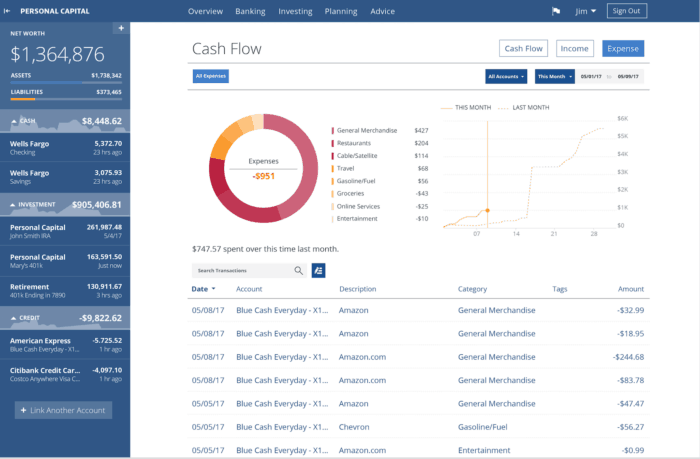 You can also track your spending, and the system constantly updates. As your net worth improves, you can see how far you’ve come. As the screenshots below show, they put the important figures like your net worth, spending, cash flow, etc. right there on your dashboard, making it very easy to see at a glance, the status of your financial health. 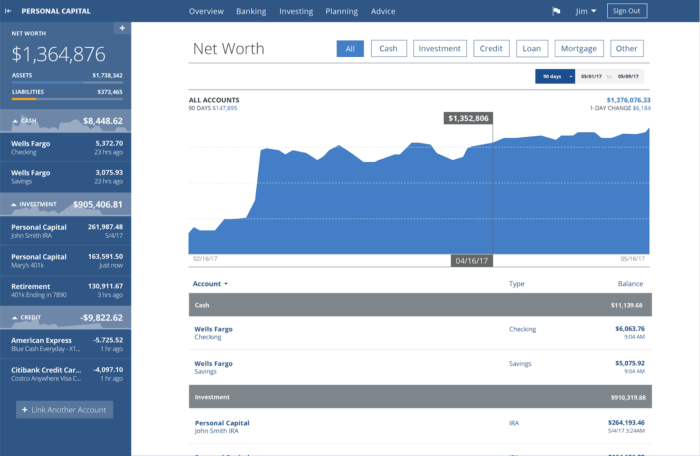 By making it so easy to monitor your net worth, the interface lets you watch it grow, which is incredibly motivating. There’s another financial tool I like called Digit. Digit automatically looks at your checking account and saves a little bit here and there from your account without you noticing. Digit analyzes your spending patterns and saves for you when it detects that you have a little bit of padding in your checking account. Some people only save a little bit using Digit while others have saved thousands of dollars. This is an easy way to automate increasing your net worth and reach your financial goals. Ultimately, knowing your net worth is an important component of being a financially healthy individual. I know mine and while I’m not proud of it, it’s going to make a truly amazing linear graph when I finally reach financial independence. Do you know your net worth? Why do you think it’s important? Do you think some people place too much value on it? How accurate of an indicator of financial independence do you think it is? I remember when we purchased our first house, the mortgage broker showed us our “negative net worth” and, though I knew it was true (student loans), having it right there in front of me was an eye-opening experience. Now I track net worth monthly. Monthly budgets and expense tracking are fantastic financial tools, but can’t give you the big picture like net worth does. Ah that is a shock for sure!